So I am super lazy, sorry about this being over a month late. I visited Quartz Lab on July 27th, 2010, for their Tuesday Open Night (TON). Flickr Set. I had a blast and made an impromptu talk about North Paw (no presentation, just off the cuff). 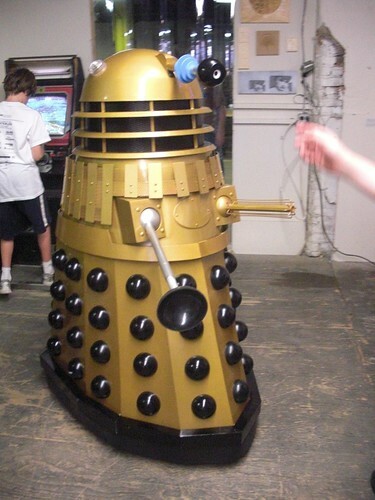 There were two guys there who were the official speakers, they had built a Dr. Who Dalek, totally awesome!!!1!!1!1!! Apparently there is a UK group of people who have published all kinds of info about how to do this yourself, and they followed those plans. But they added a powered wheel chair inside, so that you can drive the Dalek around, which is awesome. You can see both the Dalek talk and my sensebridge talk. They also did something really awesome with one of their walls: they made it into a rotating art wall. Various artists are invited to show off their works. I think it's a wonderful way to get some awesome stuff for the walls while also exposing local artists, and incidentally spreading the word about the hackerspace into the artist community... Shear genius, I tell you!